It is a good practice to spread mulch on top of your soil around your plants every spring and autumn. Mulch your garden when you want to suppress weed growth, retain moisture in your soil, keep your soil cool it also enriches garden making itceven more attractive. Mulch comes in many varieties. Shredded or chipped bark is the most common of the organic mulches. It also is the most dense, woody and dry so it will take longer for the nutrients to break down and enter the soil. Others include: compost, composted manure, straw, grass clippings, newspaper, and shredded leaves. When you use these mulches you need to know from where they originated. It is better not to have mulch containing f weed seeds to germinate in your soil. Organic mulch increases your soil's fertility giving your plants a good foundation. It has to be replaced because it naturally decomposes but as it does this your soil becomes richer in the process. Woody bark mulches do not mix well into soil so use them in places where you do not expect to be digging up the soil to put in new plants. Use bark mulches around trees, shrubs or the plantings around your house. Side dress your plants with compost and composted manure during the growing season and you will see how fast it makes your plants grow. These mulches boost the nutrients in the soil, but make sure they are weed free. The best use for straw mulch is your vegetable patch. It keeps the paths between the rows of crop weed free and less muddy. Straw mulch decomposes very slowly and will last for the whole growing season and is easy to take up at the end of the growing season. Grass clippings is the greenest of mulches, with a high water content. They decompose rather rapidly and have an odour so use this mulch in a remote area of your garden. Because of the high water content, they can be slimy and slippery. Use grass clippings to cover open, unplanted areas or bare spots on your lawn. If pesticides are used on your lawn then do not use this mulch where you want to plant flowers or vegetables. You can also mix in grass clippings (untreated only) to your compost bin. 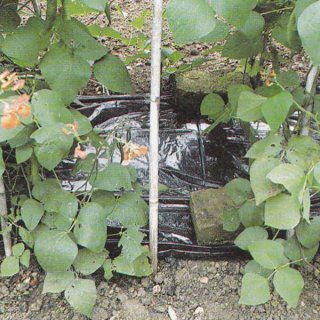 Although black plastic is not suitable for your flower borders, it is a very cheap, and effective way of covering your soil to inhibit weed growth in your kitchen or vegetable garden. 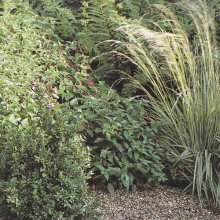 Newspaper as mulch can be laid down in layers as a weed barrier over the ground before another mulch such as bark mulch or gravel is spread over it to make a path in your garden. Shredded newspaper has been used for years to keep plant roots moist while shipping. Shredded leaves are nature's mulch and are free. Earthworms love the fallen and shredded leaves. Spread this mulch over your vegetable garden after harvesting to begin decomposing over the winter. The leaves that are not shredded retain the most moisture and in the spring you can break them up easily and work them into the soil.